awesome game...stafford brought it as well as moreno's amazing td's...lovin me some walsh too :) mark richt is an awesome coach!!! LOL don't you think SHANE? 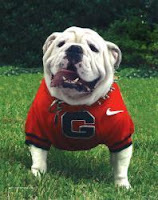 Also wanted to say WELCOME to the new mascot for Uga..Uga VII he took over because Uga VI died in june of heart failure after a nine year reign!!! The beautiful English BullDog :) LOL has been named Loran's Best after the sideline reporter Loran! Anyway...He is adorable and by far the cutest mascot ever!!! !